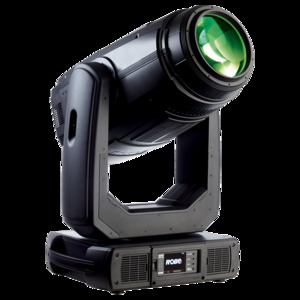 The BMFL Spot™ has a custom light source designed for Robe and produces a staggering powerful 250 000 lux at 5 meters – no other product currently on the market can equal this output! Despite its power and comprehensive feature set, it weighs just 36 Kgs… and has a compact body profile. The lamp produces light at a CRI of 90, this combined with a refined optical system, 5–55 degree zoom, results in a crisp, high quality fat beam that is truly homogenized and without a hotspot. There are also two color wheels which include filters that can be utilized to adjust color temperature and improve the CRI of the white output in aging lamps. There are two rotating gobo wheels – each with six slot & lock gobo positions. There are also two Rotating Prisms. The Dual Graphic Wheels both focus within the same focal plane and the rotation and movement can be individually controlled and varied… to create ultra-cool, infinitely subtle special effects. The frost and dimming functions provide further effects. Aimed at long-throw applications, the newly patented Robe EMS™ (Electronic Motion Stabilizer) technology, enables the BMFL™ to absorb vibrations from audio outputs, truss movement, sprung or suspended floors, etc. The BMFL™ is a very powerful, feature packed luminaire that will provide a real signature light source for any project.